ATX has been around for almost a decade now, and despite that fact that it has gone through quite a few revisions ever since its conception, it is starting to show its age. The biggest problem with ATX is that it leaves too much room for interpretation by the manufacturer of the ATX motherboard or –case. For example, the size of the motherboard is set, and so are the exact locations for the expansion slots on the motherboard and the standoffs in the case. The ATX specification however does not define a set location for the processor socket, memory slots or even the power supply connector. You just have to look at the vast amount of different motherboards from different manufacturers to realize that this is exactly the result of the ATX specification lacking these requirements. You’ll be hard pressed to find five motherboards with the same chipset that have the socket, power connector and other I/O in the exact same location. 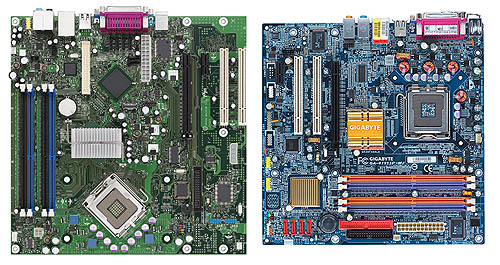 Two Intel 915 motherboards, Micro-BTX to the left, Micro-ATX to the right, click here for a full size image. This means that it is difficult for manufacturers, but also enthusiasts, to pick components that work well together. Some cases won’t allow you to install specific motherboards because the power supply gets in the way of the processor heatsink. Or worse, the case only works with a specific type of power supply because the cables of normal power supplies aren’t long enough to reach the motherboard. That too, is not included in the ATX specification, and will usually mean that picking parts is trail and error to some extent. Of course these examples aren’t a common, everyday, occurrence, they do happen though. But there’s more; when the ATX specification was being drafted processors put out a, compared to today’s standards, measly 20 to 30 watts and the video card was not a major contributor to system temperature and power consumption at all. A look at the heatsink of the micro-BTX platform, click here for a full size image. Modern processors however generate up to 130-watts of heat, and that heat needs to be removed from the case efficiently. The same applies to modern graphic cards, not seldom do they generate up to 75-watts of heat, which, again, is dumped inside the case, raising the case temperature. Although not part of the ATX specification case manufacturers have over the years started to add case fans to their cases to guarantee a good airflow in the case to keep the temperature at acceptable levels. Unfortunately adding case fans is not a guarantee that you’ll get low temperatures, as cable routing and other obstructions can seriously hamper airflow. The result is that case temperature and air flow have, again, got to be optimized by trial and error. To remedy all of these problems in one fell swoop Intel has drafted the BTX standard, which addresses all of the problems described above. A micro-BTX case with the air duct that is placed over the processor on the motherboard. The BTX standard defines a new layout for the motherboard where the two major contributors to raising the case temperature, the processor and graphic card, have direct airflow over them. 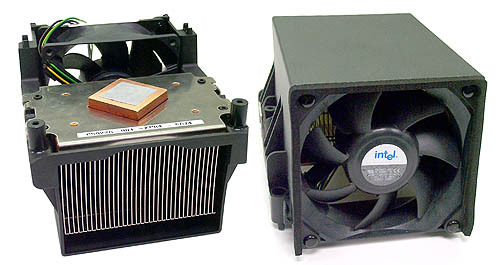 The processor’s heatsink is placed in an air duct which draws cold air from outside of the case directly in, without being hampered by any obstructions. This air duct is part of a BTX case and its location and size adhere to strict specifications, as does the location of the processor socket on the motherboard. All other components such as the power connector, memory and expansion slots also have a set location on the motherboard, thus allowing a BTX case and motherboard to be tailored to each other’s needs exactly. Because of this efficient use of space, BTX cases can be smaller than ATX cases, as they make optimum use of the available space, but, due to the optimized airflow, run cooler than ATX. All in all BTX looks like it is able to tackle some of the problems that are troubling ATX, yet it is up to the case and motherboard manufacturers whether they’ll adopt the new standard quickly. Maybe once OEMs such as Dell and IBM start using the new form factor we’ll see it trickle down into the retail channel as well. In the meanwhile we’re stuck with ATX and the vast number of unique motherboards, cases, heatsinks and other components, which are often brought together in odd configurations. To be honest that has its charm as well, and to many enthusiasts that’s part of why they see building PCs as a hobby, the ability to create unique combinations by picking just those components they see fit from the vast number of different components offered for sale. If BTX ever replaces ATX we’ll see a decline in the ability to create something really unique, as many of the specifications will be cast in stone, rather than up to the creativity of the manufacturers. On the 26th of January we've published a full featured article about one of the first shipping systems based on BTX, you can find this article at the below noted url. Intel's BTX form factor, with a B for better?